A native of Japan, this beautiful delicate perennial produces arching branches with sprays of dangling heart-shaped flowers that are pink with white tips or solid white. The plant will bloom in the spring through summer and once established is relatively trouble-free. Bleeding heart is hardy to zone 3 -9 and will tolerate the cold winters in Northern states. Bleeding heart can be planted in the spring or fall in moist, rich, well-drained soil and in semi-shade to shade. Plant it in an area where is gets direct sun early in the day and avoid the midday full sun, as that will cause the foliage to dieback prematurely. Maintain even moisture during the growing season. If needed place a layer of 1-2 inches of mulch around the plant away from the base to keep the soil evenly moist. When the hot summer sets in, the foliage will turn yellow, die back and go into summer dormancy. Divide the plant in the spring every 5 years to reduce overcrowding and produce new plants. You can also divide in the fall after the foliage dies back. A mature plant will produce seeds making more give away plants. Bleeding heart is relatively disease free except for wilt and stem rot caused by a fungus from growing in water-logged, wet soil. Note – All parts of this plant are poisonous. I bought a bleeding heart to keep indoors this spring (I live in an apartment and can’t plant outside). It has done well all spring and summer in a well-lit window — but now that the weather has turned chilly, the leaves are beginning to turn yellow. Do bleeding hearts that live indoors go into dormancy? Or, should I assume that there’s a nitrogen deficiency in the soil? Just to be clear are you growing bleeding heart – Dicentra spectabilis? Bleeding heart is a perennial plant that grows outdoors and goes dormant during the heat of summer. My guess would be that it has gone dormant. We have a beautiful pink bleeding heart that is about 5 years old. We live in New England, and have already cut back for the dormant season. We are planning to move. Can I dig up the roots and store it for a move? What if we do not move before the freeze? Will it last over the winter? Yes, you can dig up the roots. Make sure the container is deep enough to accommodate the long roots. Store the pot in a cool dark place. If you need to store it through the winter, simply keep the pot in a garage or basement until you are ready to plant in the ground. You don’t want the pot exposed to freezing temperatures as a pot doesn’t have enough insulation to protect the roots. Make sure you keep the soil slightly moist by watering once a month during the winter. I planted three bleeding hearts but I wasn’t sure which side was up. I planted the thick, whitish parts facing down. Did I do it right?? I’m not sure what the crown is! Bleeding heart roots can be somewhat confusing. Plant the narrow pointed tips down into the soil (like a carrot root). The crown is where the roots converge at the top. You may have two or more roots attached at the top. Hope this helps. I just bought a bleeding heart at the nursery, along with some mulch. On the way home one of the bags of mulch fell on top of the bleeding heart! Some of the stems broke….will it be ok? Or should I go back for a new one? It depends on how many stems broke off. All the plants energy has been transferred to the stems and leaves now so your success rate is diminished with every broken stem. If you want to get off to a good start, I would exchange it for another one. I had two sets of bare root Bleeding Heart Pink from Home Depot planted last late spring in West Texas. One set went in the flower bed and never came out. Another 3 roots were planted in extra large pots and they showed signs of growth earlier this spring. However, two out of three appear to wilt and rot at the basal of the crown. None of them ever flowered. They are in the sheltered area where winds could do much of the damage and they get full sun for only a few hours. If it is fungal disease, can they be saved by digging them out now and replanting in a shady area in the garden? Or repotting them and covering with a plastic to stimulate the route growth? So last year around may/june I planted 1 root of bleeding hearts that I bought from my local walmart and they never came up. I don’t know what I’m doing wrong! Plant bleeding heart roots in early spring. Since you planted it in May/June chances are the roots were not in the best shape, perhaps dried out because they sat in the store for a few months. That may be the reason why they never came up. Bleeding heart is worth a second try. Your best chance for success is to get a plant that is already potted. If you do buy roots, look for healthy plump roots. The pointed end goes down into the ground. The crown (flat part) should be at the soil line or slightly below. Dig a hole up to 12 inches deep (depending on root size) to accommodate the root. Plant 2 ft apart. I’m trying to kill it too. Have you found anything? I have had a bleeding heart plant that has come up for over 50 years. This year it did not come up. I am very upset about this. What could have happened? Is there anything I can do? Is there a chance it will come up next year or should I assume that the life of this plant is over? There’s a good chance that it is over, 50 years is a long time for a perennial. Sorry. I would check the area below the soil and see if there are some viable roots or if the roots have rotted away. The plant should have produced some offsprings. My bleeding heart produces several new plants each year. I’m just outside of Vancouver, British Columbia (zone 7/8) and have a small garden with full sun exposure. I love bleeding hearts and really wanted one to plant beside a beautiful pink rhodo but knew that the plant would suffer with the lack of shade. My solution was to use patio umbrellas strategically around my garden. In the early spring, usually right after my rhodo blooms, we get a lot of rain. I started putting a patio umbrella over the rhodo to protect the blooms. Once the bleeding heart is in full bloom I start putting the umbrella over it to give it a rest in the afternoon from the direct sun. There is hope for those who love shade plants but have a full sun garden! Thanks for sharing your gardening tip. I just bought a bleeding heart vine clerodendrum thomsoniae it came it a box with a bag and a little soil around the roots, I immediately transplanted it in a large pot but the leaves look like there wilting still, its been a few days, is it in shock? what should I do? It is in shock. Give your plant some time to adjust and develop more roots. Keep the soil moist but not too wet. I had 4 bleeding heart bushes planted in April and before long they turned yellow and now look like just dry twigs in the ground…I am panicking…help!! Don’t panic. It’s normal for bleeding heart to die back and go dormant in the summer, especially if its hot. Look for it to return next spring. I have read that Bleeding Hearts die back in hot weather. I planted one that gets late morning and midday sun, about 5 hours. Is this too much? The leaves are already getting pale after a few weeks, but the weather is also now into the mid 80’s. I can move it to a shady area now or in the fall, but that spot gets almost no direct sun. Thanks for your advice. Bleeding heart don’t need direct sun to grow in fact they prefer a shaded area. You can move as soon as the foliage dies back to the ground. My mom grew one of these when I was a little kid. I have a small garden in front of my apartment. I picked out a bleeding heart for the corner because that side is usually in shade. We have had a few hot afternoons so far this summer, but as I said, I planted it in a corner that is usually shaded and more wet than the rest of the garden. All of the hearts have fallen off in the last week or so. But the foliage is still very green and not wilted at all. Will it put out more flowers? Is there a way to encourage new flower growth? Or is it possibly done for the season? I have seen other bleeding hearts around town that still have many hearts on them. Could it be getting too much shade or water? Your bleeding heart could put on a bit new growth and minimal flowers but for the most part once it’s done blooming it’s done for the season. I hope you are on the road to recovery. Gardening can be of great help to you. Watching the fruits of your labor flourish and grow will give you joy and satisfaction. Gardening is a life long learning experience and it’s never too late to start. You can trim your bleeding heart back if it is too large. It will start to yellow and die back with the hot summer weather. You can also divide the plant in the fall or early spring which should also reduce it’s size. Can you suggest plants that do well around bleeding hearts? I have a line of them in a flower bed and want something that will look good when the bleeding hearts die back in the heat. I’m in Wisconsin and on the boarder between zones 4 and 5. I appreciate any help you can give me. Bleeding heart is a shade loving perennial and any shade or part sun plants will make great companions. Some plants you can use is aruncus (goats beard), columbine, ferns, foxglove, hosta, toad lily, brunneria, solomon seal, astillbe, hardy geranium, heuchera and day lilies. I am in TX, zone 7, it is Mid-may already and I bought 2 roots at Walmart. Is it ok to plant them in this time of the year? You can plant them now or in the fall. If you plant them now they will probably not do anything until the fall or next spring. Bleeding heart die back in hot weather. My bleeding heart hasn’t come up yet (It’s May!). Is there still a chance it will come up? Or, do you suppose our icey Nova Scotia winter did it in? It should be up by now. Bleeding heart is hardy in zone 3. If you had a very cold spring it may be slow to come up. Hi, Please Help Me!!! I just bought a Bleeding Heart Bulb. I don’t which end goes down in the soil. Brown tubes going all different way or the other side. A few years ago, I planted a Bleeding Heart in my shady garden on the South side of the house, beneath a tree. It disappeared for a season after dying back seemingly quickly. Now it seems to be back, but it is tiny. Last year it was also alive but miniscule. No blossoms, of course. It’s not getting enough of something but I don’t know what. Can you help? It gets some sun in the mornings and early noon, then is in shade. Bleeding heart can take a few years to get established and longer if it is growing in a difficult situation. A southern exposure sounds a bit too much sun and perhaps your plant dies back too quickly because of it. Eventhough they tolerate sun for about 4 hrs, they prefer sem-shade and filtered light. If it is the exposure, you may want to move it to a better location. I have a large bleeding heart in full bloom. Can I cut lengths of it and put them in a vase with water inside the house? Yes, you can cut a few stems to enjoy indoors. Just don’t get carried away, and let a few leaves remain on the plant. It’s always heart breaking when the plant starts to grow and then gets frost damage. But you never know what the weather will do lately. Your bleeding heart can send out new growth from the roots, so don’t give up on it. Remove the frozen parts once the dry out. When you see new growth, side dress with a balanced fertilizer to give it a growing boost. It is said that all the parts to the bleeding hearts are poisonous. I have many dogs and recently bought one of these plants, is this dangerous to be around animals or children? I bought two Bleeding Hearts … I have problems telling which end goes down and which end goes up. The end that looks like look like cut off tree limb stubs … these go up or down? i bought a bleeding heart last year and it flourished in my shady backyard. towards the end of the season my dog trampled it and it died off. (i think my dog had good timing, though. we were already well into summer when it would naturally start to die back anyway.) this year in february i noticed it was starting to bud back out of the ground. since then my chickens were let loose in the yard and pecked all the new buds away. currently it’s down to the rooty stub int he ground. is there still a chance it may grow back later this spring, when the weather warms up?? it’s mid/late march now, and we are still getting occasional snow and hail and temps are anywhere from low 40’s to high 50’s on any given day. the stump in the ground looks green but any sign of buds growing has been pecked away. I would wait a bit to see what happens. Your bleeding heart may still have more life in the roots. If there is new growth, it will be minimal. I would suggest that you put a protective barrier around the plant to keep the chickens out. If there is a frost in the forcast, be sure to cover the new sprouts, as they are sensitive to cold temperatures. Bleeding heart (Dicentra) needs a cold period to grow and bloom well. They start to yellow and die back and go dormant in hot weather. Me and my husband are planning on building a new house and I have a Bleeding Heart plant planted next to my old farm house that we are going to tear down and I am wanting to put it in a pot and transplanted when we get the new house built will it make it in a pot or should I plant it somewhere else in my yard. And I noticed it is starting to come up here the other day. Thank you for your help. Thank you for the help and the good information I might do that I am hoping I don’t have to dig it up. Until this fall and then replant it at the new house. Thank you again you was very helpful. This is the first year I have had my bleeding heart and it has flowered beautifully. My problem is now it is being eaten by something. I can’t see anything on it and also the flowers are turning a mauve colour. Can you please advise me what to do as I would hate to loose it? The flowers will turn a mauve color as they get older. I can’t tell you what is eating the plant slugs and snails are a possibility. They feed at night. Keep in mind that it will die back to the ground once the weather gets hot and return next spring. One year, I planted bleeding hearts bulb in the fall , it came up the following spring but it did not come up the following year so I asked the merchant to send me another bulb. That one did not come up in the spring either. I am trying again since my daughter loves that plant but I am ready to give up. Sorry you have such a problem with planting bleeding heart. Try planting it in the spring. The roots should be planted pointed tips down. The crown should be at the soil line, or the same depth that it was growing at, otherwise it may just rot. 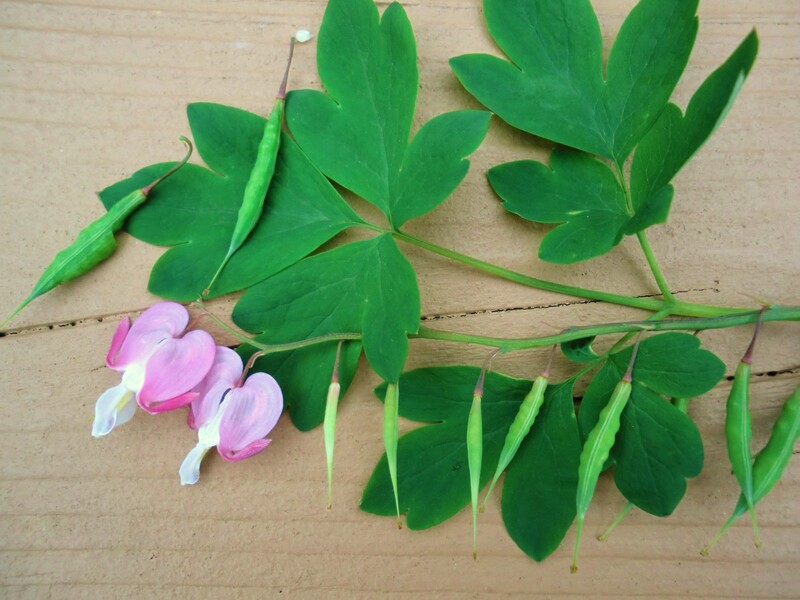 Hi did any1 know where to find or buy the seeds of the Bleeding Heart (Dicentra spectabilis)? I bought mine from a Walmart Super center, but you can get them from the Michigan bulb company. Dig it up and cut it back now. Make sure the pot if large and deep enough to accomodate the roots. Put your bleeding heart plant back into the soil asap for the winter. Add a few inches of mulch during the winter to protect the roots. If the foliage is starting to turn yellow, you can move it. After transplanting, make sure it gets enough moisture during the summer heat. I have divided part of my old fashioned Bleeding Heart to another garden this Spring. I noticed today that it needs to be moved back and I would like to plant some Stella d Oro as a border in front of it as other interest as it dies back. When moving it back it will be near a pine tree. Will it survive? Can it be near acid soil from a Pine? It should be fine undeer the pine tree. Heavy storms whipped the foliage completly off one of my bleeding hearts. Only one tiny sprig remains. Will it come back again next year as large as it was? It should come back next year. By this time, it was enough reserves in the roots to return. I planted two bleeding heart roots 3 years ago one did not come up the other is an absolute Monster. It is so out of control it has taken over my garden. I am 5’10” and it comes up to my neck it is also about eight feet around. I would like to tame it with out killing it. My parents would like me to transplant some of it in their yard. Can you please advise me what to do. It has swallowed up my azailia bush and a rose bush and several other perennials. I love this plant but it is out of control, help. I have 2 others and they are nothing like this one they are very manageable. You can tame the beast by trimming it back. You can divide the plant in spring or in the fall after it dies back to the ground. I just baught a bleeding heart that is in flower but is to big. How do i divide this plant to create more then 1 other plant? And do the leaves and stems that are dieing off need to be trimmed back? Also would it survive in a pot in the house if it still gets direct run durning morning and shade during the afternoon and evening? Since you just bought the plant, it probably cannot be divided. Best time to divide is when it goes dormant (summer) or early spring as it is emerging from the ground. Bleeding heart will dieback with warm weather so wait until the leaves turn yellow, then you can try to divide it. It would not survive in a pot in the house. It needs a cold dormant period in winter. i have a very old, very big bleeding heart that is finished flowering for the summer and taking up space and light from other flowers planted near it. i wanted to make sure first that i can cut back a bleeding heart (dicentra) after blooming but while still green and growing without affecting the plant next year? and- if it will affect next years plant, in what way? Being an old established plant, I think you can cut it back without ill effects in the future. The leaves do put back nutrients into the roots systems. By now the root system is so deep and extensive that it will tolerate a trimming. I’m surprised that you don’t have more plants reseeding around it. I just trimmed mine for the same reason. If you have plants competing for light you might consider moving one to another spot. Look for them again in spring. I have a bleeding heart cutting that I have rooted in Florida (zone 10). I know the plant is not hardy in my zone, but would love to try to grow it if possible in a pot. I know it needs a cold period. How low of a temp and for how long is necessary? I’m not sure if you can grow a bleeding heart plant in Florida. The weather is just too hot for it. It’s hardy in zones 2-8 and dies back in warm weather. My guess would be that it needs a freezing period of 8 weeks or more. Once it gets a cold period, it may bloom in late winter. You might want to contact your local extension office to see if this is possible. A picture is worth a thousand words. see above article. I added a picture of bleeding heart seed pod. Bleeding Heart vine coming back beautifully this spring however beginning to notice white spots on the dark green leaves. Spot size ranges are generally the size of a pencil eraser and smaller. Don’t readily see anything on the underside of the leaves. I’m guessing its a pest, what could be causing the problem please? Are the spots rounded or irregular? Do they make a mosaic pattern? Have you had any hail, cold snaps in the weather? Hi. I just went out and bought a bleeding heart plant. However, I have been reading here that they do not do well in “clay dirt”. Does this mean that even though I gave it a good layer of garden soil below and on the sides of the plant and good rich mulch that it will not thrive? Or will it just not get any bigger? I had in mind that if it didn’t so well there that I could move it next spring before it takes off for the season. Sorry for the ignorant question but I’m still a newbie at the whole plant and gardening thing. Thanks in advance! It sounds like you ammended the soil by adding more organic material to it. Which is a good thing. It needs soil that drains well. Clay soil has a tendency to hold water and stay wet longer. Bleeding heart needs a few years to get established before it takes off. See how it does this year and if you choose to move it, you can do so in fall or early spring. My Bleeding Heart is planted in a shady spot. It comes back every Spring, and looks great. Problem is that it dies when the warm weather hits in Maryland. Should it last all season? No, bleeding heart will not last all season. When the hot summer sets in, the foliage will turn yellow, die back and go into summer dormancy. My HUGE bleeding heart is starting to turn yellow and die back. Can I cut it back now or do I have to wait to do it (like the foliage on spring bulbs)? We are going out of town for two weeks and I would really like to cut it back before I leave. Thank you! Yes, you can cut it back. I won’t hurt the plant. If you are refering to the perennial bleeding heart plant=Dicentra, then I wouldn’t worry about it. As the summer heats up, it will start to turn yellow and dieback anyway . Ifthat’s not the case write me back. Shortly after my husband and I moved into our current home 5 years ago I planed 2 red bleeding heart plants in a bed I put in around a clump of oak trees. These plants are on the east side of the trees and are doing very well. I planted a white variety on the west side of another clump of oak trees. The first time I planted a white one in that location it thrived over the summer and was beautiful, but it didn’t come back in the Spring. I tried planting another white one in the same location and it did very poorly and eventually died. Do you have any advice for me? Choose a different location for your bleeding heart. Your plant is competing for nutirents and moisture with the tree. White bleeding hearts seem to be less hardy than pink and white one. My bleeding heart bush is gigantic this year! Its starting to die down, can I trim it so plants around it get more sun? Yes, you can. I just trimmed mine to give other plants more sun. i got a bleeding heart root, it looks like cinnamon sticks on one end and a round ballish shape on the other end with little white things. which end goes in the ground? Put the “cinnamon sticks” into the ground, they are the roots. The balllish shape may be new growth. 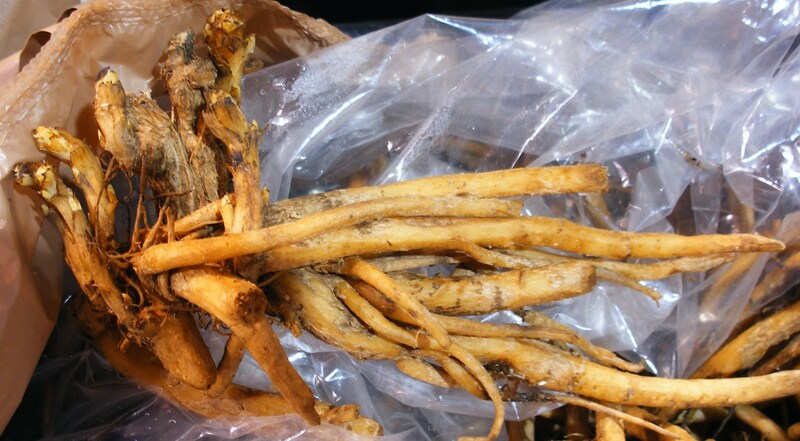 See the picture of bleeding heart roots.in the above article. The long “fingers” are the roots. ok the bleeding heart is really growing now but i have a question if the plant dies back being i’m going to keep it in the house hanging in the window could i water it though the winter so the roots don’t dry out? or stop watering it in the winter and let the roots dry out. You would have to keep the bleeding heart in a cool area and occasionally water it just enough to keep it from drying out. They need a cold dormant period (rest) in order to return next season. If it dies back, store the basket in the basement or garage making sure that the roots don’t freeze. i have a bleeding hart plant that i planted in a 6″hanging basket it was in dormancy when i bought it.this was in april.i now see a small green sprout on the side at the main stalk is this new groth? i plan to keep this as a house plant.is there a way to keep the plant green in the winter,and not die back? I have not tried or heard of it surviving as a houseplant. They die back in hot dry weather and go dormant. It’s worth a try. I have a bleeding heart that was in full bloom and it got hit with forst two nights in a row. The branches still have the leaves(wilted) and the flowers on them but are limp and have that frozen look. Can I trim them back and will it continue growing and producing flowers. Yes, you can trim the cold damaged parts back as they are of no use now. The plant may still send out a bit of new growth and minimal flowers. I planted 6 bleading heart roots systems into a large pot and after 2 months not 1 of them have sprouted above the ground. I dug up 2 of them and they all have made fresh roots but nothing above the ground. Is this normal for them? or is there something I need to do to get them to sprout? Is it possible that you planted the roots too deep? The crowns should be planted level at the soil line or if you planted bare roots, the growing points (crowns) should be 1″ below the soil surface. Did you see any growing points or crowns when you planted? If not, it may take longer to sprout. New root growth is a good sign, it may just take a little longer to get the foliage. I have a beautiful bleeding heart plant and the wind broke off alot of branches and blooms. Should I cut off the broken stems? Will it come back with blossoms? Cut off the broken stems. It may send out a little new growth and if any a few flowers. I brought bleeding heart a few weeks ago and with in the first week all the flowers wilted and fell off! I made sure the pot was drained well and I always check to see if the water is not to damp! The plant started to grow a lot and there is plenty of new growth but all the older leaves are slowly turning brown.. what does this mean? As long as you have new growth, there’s nothing to worry about. The plant will loose som leaves just from stress, change of environment etc. Keep in mind it will eventually turn yellow and die back when the hot weather sets in. I’ve grown an old-fashioned pink bleeding heart for years, dividing it and transplanting the volunteers around the yard. Today I found that there are two white bleeding hearts growing near one of my established pink ones. Could these be seedlings of the pink–are they a sport? Sometimes the new seedlings from the pink can revert to white. Mine does the same thing. I have a beautiful, seven-year-old bleeding heart plant that has lived in full sun for several years. Right now it is blooming vigorously, as per usual this time of year. I am moving to a new house and desperately want to bring the plant with me, but I’m afraid to dig it up while it’s blooming (or too soon after it stops blooming). I also don’t know how far out I should start digging a hole so as not to damage what I imagine is an extensive root system. Will I kill the plant if I dig it up soon? If not, what is the safest way to dig it up and transplant it? The best time to dig them up is in the early spring when you see sprouts or in the fall after the foliage dies back. The chances of survival are slimmer when the plant is fully grown. If you wan to try, dig down 12″ deep and clumps of least 6″ in diameter after a good soaking rain. The fleshy roots are brittle and break easily. Plant the clump in a large deep pot and water in well. Transplant in the fall or immediately after digging it up. If you leave it in the container. keep it in a shady spot and make sure the plant does not dry out. When watering add a root starter solution to stimulate new root growth. Don’t get greedy, take a medium size plant will have a better chance of survival. i Bought a bleedin heart like 2 years ago Love it to death and this year spring come in i went to check on it and i got all these new growth comein and i noted a massive knot of roots below it or bulbs. and not sure if i should try to break apart and plant more . I never tended to it much infact im more like take plants stick’em and let nature handle with a little help oddly poor soil in my back yard something you see more in a forest wildstrawberries and other things and patchy dirty. it makes it through better then my other plants. do i have to break them apart or will they be fine . ? Leave the bleeding heart as it is. It will be fine. If healthy, it will spread and or reseed itself when it matures which takes about 5 years. I have a very large plant with a 3 x 5 dark green flat, sorta heart shaped leaf. The bloom is white with five petals and deep red bloom in the middle. I bought the plant as a Bleeding Heart 20 years ago. The plant is in a large clay pot that winters in a heated room. I need to know when and how to prune it and also what is it. I know you like these types of questions! What you describe is a Bleeding heart vine (Clerodendrum thompsoniae) also known as Glory bower vine. Prune it in late winter or early spring before new growth starts. Don’t be afriaid to prune severely and remove any old or dead stems. After pruning water and move the plant to a sunny spot. It blooms on new growth so a good pruning will stimulate new bushy growth and more flowers. In warmer climates you would prune it right after bloom. I planted a pink bleeding heart plant several several years ago and it blooms every year but it never got any larger or fuller than when I first planted it. The plant gets about 15 inches tall and consistantly has six stems every year. I have seen them in other areas and they look like bushes and are twice as tall as mine. My bleeding heart did that as well. It was growing next to a birch tree, when the tree died it started growing like crazy and almost took over the whole bed. There may be competition for moisture, nutrients and sun from other plants. You might want to fertilize them in the spring and see if that will boost their growth. Also,they don’t grow well in clay soil. I live in the Buffalo NY area. I have lots of baby bleeding hearts. Can I pot them now, in August, to hold over the winter? You don’t mention where & how you are planning to winter over the plants. If you leave them outdoors in pots, the roots will freeze. Unless you are digging them up to give away or to transplant, I would wait till the spring. I have two bleeeding heart plants that I started from a bulb I have had them for two years and have never pruned them or cut them back. One of them is so very BIG it is overtaking. When and how is the best time to try get another plant out of them and will it do ok? The wind broke stems off it last year and it still came back bigger in size than last year. can I divide is now a good time….I’d like to start another plant but not sure the best way to go about it….but it is HUGE! Any help would be appreciated. Fall is a good time to divide bleeding heart. Once the foliage has died back to the ground. Spring is even better. I have a bleeding heart, which has a northeast exposure. It gets morning sun and has bloomed beaufifully last late spring/early summer and this late spring/early summer. Both last year and this year after the blooms are gone, the entire plant turns yellow. Last summer I cut the plant down right away. I haven’t done that yet and I’m not sure what I should do. I see other bleeding hearts in my neighborhood and the plants remain green all summer. Please let me know what the problem might be and how to correct it. Bleeding heart naturally dies back after bloom, especially if the summer is hot and dry. Evenly moist soil may keep it green and prolong bloom for a little while longer but it will turn yellow/brown by the end of summer. I cut away my yellowing foliage and plant some colorful annuals to fill in with color. You can also plant perennials such as hosta, babies -breath to fill in when your bleeding heart is gone. Perhaps your neighbors plants are in a protected cooler, shaded area that keeps them growing longer. Wait until it dies back-turns brown, then transplant it. If you transplant it now, the plant will suffer. It will wilt and look bad but most likely will survive. my bleeding hearts did not flower this spring and plant turned yellow by mid june. Lives in mostly shade and is well watered by sprinkler system. What am I doing wrong? Your bleeding heart may need more light to bloom. You don’t say how old it is. If it is newly planted then it may need another year to mature. Bleeding heart normally turns yellow and dies back when the weather warms up. This is the second year for my bleeding hearts plant. The overall plant is growing and looking healthy but there are not a lot of buds and flowers. It looks sparce. Do they need a lot of fertilizer? Bleeding heart needs rich organic soil and once established do not need a lot of fertilizer. An annual application of compost or some type of organic fertilizer in spring should be sufficient. Your bleeding heart may not be blooming as much because it is not getting enough sun or if you fertilized the soil with too much nitrogen (first #). Also, they seem to bloom better as they get older, mine are 20 yrs old and I don’t feed them, but they are in well-drained, rich organic soil. I planted two bleeding hearts this year. One gets just a little bit more shade than the other – not much though. The only that is getting the shade is doing very well. The other one is turning yellow and looks like it is going to die. Should I replant the yellowing one? Bleeding heart prefers a semi-shaded area and will last longer in a shaded area. It usually, turns yellow and dies back to the ground in summer when temperatures heat up. An established plant will tolerate more sun than a newly planted one. It may grow better next year. If you want to move it, wait till the fall to transplant it. i have a beatiful potted bleeding heart. Last winter I wasn’t sure what to do with it so i stuck it in our shed. I brought it out a few weeks ago and I’m thrilled to see it is growing foliage! My question is how early could I have brought it our from the shed? we live in ohio zone 6. All of our neighbor’s bleeding hearts are already blooming. Thanks for your help! Bleeding heart are quite hardy and start showing up in March/early April (early spring). The only time the tender foliage needs protection is when there is a frost emminent. unsure how to plant bleeding heart root which way is which? The roots are firm to the touch like a carrot or parsnip. The roots are long carrot-like “tubes”. If you can squeeze the tubular “stem” and its juicy then its a stem. can you send me a picture? I planted a bleeding heart on the south facing side of our new house in 2005 (located in MN). I’ve read that it’s normal for the plant to flower, yellow and die back..such is the normal cycle. Thing is, in my plant’s case, it had reached maturity and full bloom by the first week of May this year. It’s only May 15 and while most other bleeding hearts are only 10″ tall now at relatives homes, mine is already beginnning to yellow and die back. So, my question to you is how soon can I dig it up and move it. Obviously it’s in a too sunny spot and needs to be placed elsewhere. I’m concerned about damaging the root system, so how do I dig it up and when could I? Once it dies back to the ground, mark the area and transplant it in late summer/early fall to your new spot. I bought 2 bleeding heart roots. I m not sure which way to plant them… on one side there are white things coming out. I think it may be the roots but im not sure.. can you help? Plant the pointed tip of the fleshy roots down into the ground. Make sure you dig a hole deep enough to accommodate the roots. The white things may be new roots emerging. New top growth would look like light green crinkly sprouts which should be above the soil line. I live in Massachusetts. As most people may know, we sometimes get harsh winters. I planted my bleeding hearts in front of my house, about 2 feet from the road. Will they survive there or will all the snow and chemicals that get plowed from the street kill them? This is the first time I am planting something here and the plants are fairly new. They are about 1 foot in height. Should I move them inside in the winter? Bleeding heart is listed as being a salt tolerant perennial. They die back to the ground. One thing you can do is to give the soil a good watering in the spring to leach the salts out of the soil. They do need a well-drained soil and light shade to grow well. You don’t have to bring it inside for the winter they are a hardy perennial and will survive a Mass. winter in the ground. We had bleeding hearts in the yard last summer when we moved in. After we raked a lot in the Fall, I noticed the bleeding hearts were gone (after they died). Will they keep coming up on their own each season? Bleeding heart is a perennial and will return each year. They usually die back in late summer. 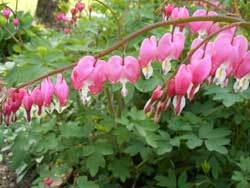 Are bleeding hearts plants or shrubs? Bleeding heart (Dicentra spectabilis and D. eximia) are perennial plants. They can grow up to 3 ft tall but die back in the summer/fall. I just bought 3 bleeding hearts roots or bulbs but it is too soon to plant them, how should I store them? If the ground is workable (not too wet) then you can plant them. If the soil is too wet to dig, keep the roots in some slightly moist soil in the garage(cool spot) until you can plant them. I’ve planted the roots for about 2 weeks, but nothing comes up yet. Is this normal? How lond does it take for the root to develop? (I am in Texas). It may be waiting for the weather to warm up. Hi, I just planted two dried roots of bleeding heart in a 10-inch pot yesterday. Is the pot too small for 2 roots? Many thanks! A 10″ pot sounds large enough. You can always repot if it gets too crowded. Only one problem, my plant never dies back nor does it stop flowering. Therefore, I don’t know when or if I should trim it back. It is growing on a trellis and is nothing but wood at the bottom and top heavy. It did receive some frost damage at the top this winter. Can I trim it back? I believe the bleeding heart plant you are referring to is Clerodendrum thompsoniae commonly referred to as Glory Bower or Bleeding Hearts vine. This twining evergreen vine blooms in spring-summer. This is not the same plant as Dicentra spectabilis bleeding heart. Using common names can sometimes become a problem because there may be several plants that have the same common name but are completely different. Glory Bower is a beautiful twining evergreen vine that flowers in spring-summer and has blooms that resemble D. spectabilis. Pruning is recommended after flowering cycle or anytime growth becomes excessive as they grow back vigorously when pruned severly. Trim it before it starts to put on new growth.-Most likely now. There’s no telling whether your Bleeding heart vines (Clerodendrum thompsoniae) have winter damage and the vines died or it dropped its leaves from the cold. They are marginally hardy in your area since they are listed as hardy in zones 9-12 but in protected areas can winterover. You can wait and see if the vine will send out new growth or cut it back since they do respond well to severe pruning. My bleeding heart has become woody at the bottom and very top heavy with leaves at the top. I have never cut it back. What is the rule on cutting the back? When? and how far back should they be cut? Bleeding heart is a perennial that will die back to the ground each year, so pruning isn’t necessary. I cut it back in early fall when the foliage turns yellow and dies back. Pruning in early spring will reduce the amount of flowers. I have trimmed it after the main flush of flowering to control the size. It will send out new stems and prolong additional bloom. As they age, the center of the clump will become woody and eventually dry up and die. This is a good indicator that it needs to be divided. Clumps can be divided every 5 years. The roots will spread underground and start new plants around the woody center. The crowded plants/roots should then be divided or thinned out. Do this in early spring just when new growth starts to show. Also look at the base of the plant, if conditions are right you may have lots of baby plants growing from seed. You’ll have plenty of new bleeding hearts to give to your friends. Bleeding hearts can be planted this time of year. I suggest you do it right away. To plant dig a hole about 1 ft deep, enough to make room for the long fleshy roots to fit in. Mix in organic material such as compost or peat if needed. Plant it so that the crown of the plant is at soil level. Fill in with soil and water well. After the soil freezes, add 2 inches of mulch around the plant to protect the roots in winter. They should be spaced at least 2 feet apart as they will develop a large extensive root system. Can you bring a bleeding heart inside for the winter? I have it in a pot on my porch. I live on Cape Cod. Should winter care of the Bleeding heart include, cutting back, & covering with burlap and straw. I prefer not to dig it up. Bleeding heart (Dicentra spectabilis) is hardy in zone 3-9. I’m sure Cape Cod falls within that zone. Once established, it needs little care. Leave it in the ground. Cut back the browned foliage and mulch(optional) it after a hard frost. i planted two bleeding hearts this year, they had a few blooms on them, but they faded to a very light pale pink. and the one that is in more sun had completely lost its blooms. the other in more shade seems to be getting a new branch of blooms. I am afraid my soil is not the best it has a lot of little pebbles in it. Also could you explain even moisture i am just watering it the same as all my other plants and flowers. Bleeding hearts prefer shade and will fade faster in more sun and heat. Once they get established and develop a good root system, they will linger longer. To maintain even moisture is to make sure that the plant soil does not dry out between watering and at the same time isn’t soaking wet. It’s a fine balance of a moist surface but not soggy soil. If the top 1 inch of soil is dry then water. The pebbles are fine as long as the soil drains well. Bleeding heart will usually turn yellow and die back after flowering, esp. when the weather warms up and gets hot and dry. Once the leaves turn yellow or die cut them back to the ground. I purchased a white bleeding heart from a local nursery a couple of weeks ago and planted on north facing side of house with hostas. I’m zone 7, but I think it might be a little too early for yellowing/dieback for summer…it’s only the end of May!? HELP! This plant looks like it’s about shrivel up into nothing! It is too early for them to turn yellow . You might want to check the base of the plant’s stem and see if its turning black which would be a sign of wilt and stem rot. This is caused by a fungus that causes the leaves to turn yellow and wilt and stems to fall over. Rot usually happens when the soil doesn’t drain well or the plant is overwatered- too much rain. Transplanting and getting accilmated to new growing conditions, hot and dry weather will also cause the leaves to yellow and the plant to go dormant. Someone gave me a large cutting of a bleeding heart as a gift. It of course was already in full bloom. Right now it is sitting in water. Can I put it in the ground? Does it have a root? If it does rather than keeping it in water, put it in a pot of soil or plant it directly in the ground. Be sure to water it in and give it some shade until it builds up new roots. If it has no roots treat it as a cut flower. I just recently found a small bleeding heart plant in an old flower bed beside my new house. I want to get it out of there and put it in a pot. How should I go about transplanting it? Dig up as much of the roots, dig a larger clump of soil than you expect, you can always remove the soil around the roots. Fill a container half way with good potting soil , insert the clump of roots and cover with more soil. Water in well and put it in a shaded area for a few days. Small plants are easily transplanted. I live in RI and have a Bleeding Heart that is a georgous plant and the mother of many plants handed to many family and friends. We cut it back each yr when the leaves turn yellow and it comes back bigger and better each time. This past winter I brought home a piece of my mothers that came from FL. It’s different in that it has a more woody stem. I have planted it in a large pot and it has grown well all summer but I am not sure how to treat it for the winter. Since this plant came from FL and does not die back after flowering I don’t know if I should plant it in the ground and hope it makes it during our hard winters or should I bring it in the house or maybe our root cellar? Bleeding heart (Dicentra) should be hardy in our area, I’m surprised it grows in Florida as it doesn’t like hot weather-it must grow there in the cooler season. You can either plant it in the ground and mulch it well to keep the roots from freezing or store it dormant in a garage, cellar and plant it next spring. I have 2 bleeding heart bulbs to plant and they just look like dried up roots. I can’t tell where the crown is. Help! Look for a growing point or an eye, if you don’t see it, plant the bare-root pointed tip down and 1 inch below the soil surface. My bleeding hearts are huge plants and though gradually yellowing, not dying back very quickly. The hostas and astilbe around them are somewhat buried by the foliage. Would it be OK to trim the bleeding heart foliage enough to get them more light? If the bleeding heart is starting to yellow then you can trim it back. If not you can still trim it back, as long as the plant is well established, I don’t think it will harm it and your other plants will be happy. I just did the same thing. I cut back my yellowing bleeding heart so the annuals I planted in front of it can get more light and bloom. I just recently bought a bleeding heart with the fern like leaves and it was doing okay and now it looks like it has shrunk and is drying up. I need help because I don’t want to loose another one. Please help! It may be possible that your bleeding heart (Dicentra eximia) is planted in the wrong spot. It may be too dry, too hot, too much sun (prefer light shade). They don’t like clayey or waterlogged soil but need rich, well-drained soil. New transplants need extra TLC until they can establish a good root system. Every time I try to transplant a piece of bleeding heart it dies. What am I doing wrong. The best time to transplant is in early spring, when the plant is 3 inches tall and leaves are just coming out. A fully leafed out plant uses up a lot of energy to get to that point so when you dig it up and disturb the roots, it has a hard time maintaining all those leaves. When transplanting make sure you water it in well and that it stays moist and not allowed to dry out. Try a transplant fertilizer which helps speed up root development. Also consider the area-is the soil well drained? Is it in semi- shade? If you have small seedlings growing around the mother plant you can transplant those at anytime. I have had good luck with digging up the very young seedlings and growing them in a pot until they get a good root structure. Hope this is of some help to you. Dividing a bleeding heart is digging up a section of the plant with a root system. Be careful how you handle the roots as they are brittle and break easily. Division is best in early spring just as new growth appears but you can also do it in the fall. From the size of your plant, I’m sure you will also find seedlings in your flower bed that you can transplant. Can a bleeding heart be divided in spring once leaves are already up? It depends on how far along the plant is. If the leaves are 3″ high that should be ok. If the plant is fully opened then your chances of a successful division is reduced. The plant has used up all its energy to emerge. When you divide a fully leafed out plant, the stressed roots cannot support all the leaves. If you try it, do it on a cloudy, cool day and water the plant before dividing. Place the division in a cool, shady spot and water well, keeping it moist until you see signs of new growth. What can I co-plant with my bleeding hearts that will come up when the plants die down in the summer? You can combine any shade/semi-shade plant with your bleeding heart. For starters try, astilbe, baby’s breath hosta, goutweed, wild ginger, periwinkle, pachysandra, iris or forget-me-not. Add some colorful annuals such as impatiens, begonia, coleus which will fill in your shady garden nicely after the bleeding heart has died back. WILL IT GROW THIS YEAR? Just leave it for the time being and see how much damage it incurred. If it is a mature plant, the roots probably did not freeze and it should continue to grow new leaves when it warms up. Your frost bit leaves will become unsightly and eventually you can trim them later in the season. I’m trying to start a bleeding heart root in a terra cotta pot, unfortunately, I buried the whole root and did not leave the crown above the soil. Will it even grow now? It has only been in the pot a few days. Also, if I do leave it in the pot as is, how moist should the root be before it comes up? The crown should be planted at the soil line,or the same depth that it was growing at, otherwise it may just rot. I would suggest you dig it up and bring the crown up to the soil surface. You will have better chance of success. Keep the well drained soil evenly moist -not wet. I would like to know if I put a Bleeding Heart in a large pot, will it do well? After some research and discussion with several sources, we came up with one solution that made sense. The pink bleeding heart (Dicentra sp.) is the dominant gene and it is highly unlikely that it would revert to white. (the weaker gene). The most logical solution came from the Master Gardeners, who suggested that two plants (pink&white) may have been planted together and only the white one survived. I have 3 huge bleeding heart plants on the side of my house that overgrown. If I cut them back, seperate them and transplant them elsewhere will the plants be smaller when they grow back the next year? When I dug on to share the plant it was all roots. can I take the roots cut them, plant them and have a full bloom the following year? The best time to dig them up is in the early spring, although it is also possible in the fall. Space them about 2 feet apart. It’s good to divide them every five years or more to prevent overcrowding. I dig mine up with a part of the root system and a new green sprout and plant in pots or in the yard. Since the fleshy roots are brittle, dig up clumps of 6 inch in diameter. The more mature the plant is, the better chance you have of it blooming the following year. I’m trying to plant Bleeding Heart “bulbs”. They look like dried up roots. I can’t tell “up from down!”. Any clues? Try pointed (tips) down. Although the roots shouldn’t be dried up. They should be somewhat fleshy. I just bought a bleeding heart and it looks like an octopus. Are the octopus legs the roots, do they go down in the dirt, or are they the branches. Confused!! They are the roots and should be planted pointed end down.